Humble Bundle is taking a break from video games so you can listen to Salman Rushdie and William S. Burroughs. The Humble Bundle just finished its tenth indie video game compilation (not counting the frequent mobile and developer-focused packs along the way), and that's quite an achievement. That being said, it's a little difficult to follow up a landmark game bundle with even more games; sooner or later you need to mix things up. Instead, the company is taking a short break to dip its toes into alternative genres and formats, just like its stand-up comedy bundle did previously. 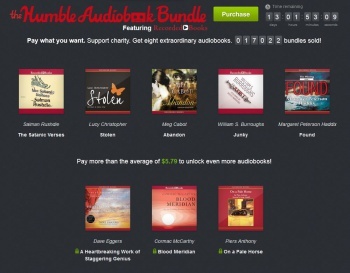 In this case, the Humble Bundle is offering a spoken word deal with the Humble Audiobook Bundle, compiling seven DRM-free audiobooks at pay-what-you-want prices. In past Humble Bundles, paying above the average would net additional titles, and the Audiobook Bundle is no exception. For the moment, that includes Cormac McCarthy's Western novel Blood Meridian, Piers Anthony's sci-fi fantasy tale On a Pale Horse, and Dave Eggers' tongue-in-cheek memoir A Heartbreaking Work of Staggering Genius. The collected audiobooks are available in mp3 format, making it easy to load them to your preferred device, with the option to send proceeds to the EFF and Worldreader charities. All told, it's an impressive-looking bundle, provided you can enjoy listening to novels just as much as you would reading word-for-word.